The surge of backpackers and travelers in Thailand has transformed a country that was once assumed to be a dirt cheap world destination to visit, into a country where money has potential to fly out of a bank account at a frightening speed. Entertainment galore and fun sounding activities are set up to entice and lure in the tourists that are willing to drop the cash. Comfy air conditioned accommodation and peaceful international restaurants serving comfort foods to weary travelers are inviting and many can’t resist. 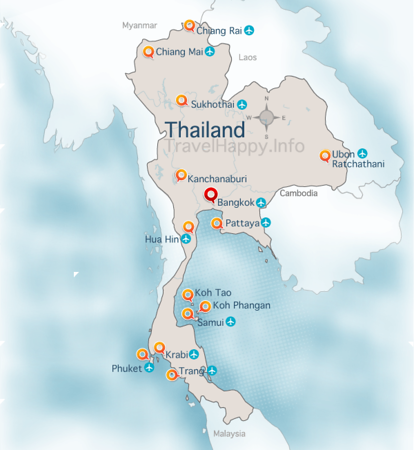 Despite this giant tourism scene that “seems” to be taking over in Thailand, in reality, it makes up just a fraction of places to visit in the country. Though it can take some pre-planning, flexibility, and thinking differently from the majority of tourists, there are still boundless opportunities for taking advantage of traveling cheaply in Thailand! Though food in general is considered quite affordable in Thailand, start dining at international restaurants or places that are concentrated with tourists, and your bill will skyrocket. In order to eat cheap in Thailand it’s necessary to stick with local street food and not indulge in massive portions of meat. Street carts that are located on the side of main roads (especially in bigger Thai cities) are often 5 – 10 THB ($0.17 – $0.33) more expensive per dish. Take a wander down a small street and discover neighborhood street food for the cheapest prices! 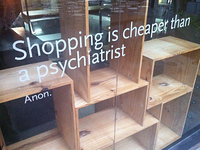 This also goes for purchasing your own market produce and fruit – to save money, never buy on the sides of main streets! A plate of stir fried vegetables (without meat) over rice should cost 25 – 30 THB ($0.83 – $1). Add chicken or pork to the mixture and it might increase to 35 – 40 THB ($1.16 – $1.32) for a plate. 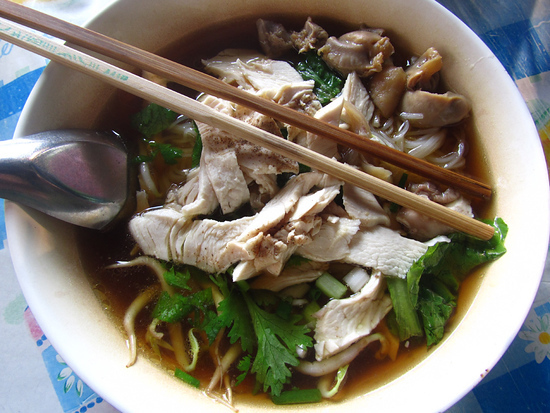 Cheapest bowls of Thai noodles can be eaten for 25 – 30 THB ($0.83 – $1) as well. I am a big eater, and when I first arrived in Thailand, I needed to eat 2 – 3 plates of food to get completely full. If you are a big eater, to save money, eat a few plates of rice with only a single dish. Those delicious looking fruit carts with the pre-cut fruit on display usually charge 10 – 15 THB ($0.33 – $0.50) for a single mango throughout Thailand. Though it’s convenient, they do make money; I go to the local market and get an entire kilo of mangoes (usually 3 or 4) for around 15 THB ($0.50). Also keep an eye out for local cafeteria style dining, places where locals eat. I used to eat lunch at the ONCB (Office of Narcotics Control Board) in Bangkok. They have a great cafeteria, where anyone is invited, and a big plate of rice with two delicious side dishes is a mere 25 THB ($0.83)! [Ed note – see also Mark’s excellent site Eating Thai Food and his comprehensive Thai Food eBook for more invaluable, practical information on the best Thai street food and exactly where to find it in Bangkok]. This might seem obvious, but the cheapest way to stay in Thailand while traveling is to find free accommodation. It’s not always easy to do this, but there are a number of options in Thailand if you make a few plans ahead of time. Couchsurfing is a website that brings together a tight knit community of travelers that seek to find free accommodation, but more importantly, interact and hang out with locals. It works like this: join Couchsurfing, search for a host in the area you are visiting, contact that host with a couchsurf request, and wait for a response. If all works out favorably and the host agrees for you to stay in their home, you have landed a free place to stay! Keep in mind that not everyone sits on the internet all day and responses are rarely immediate. Buddhism is Thailand’s most widespread religion, making the country home to countless monasteries and temples. Many temples are places for monks and others to meditate and obtain relief from the fast pace of everyday life. You don’t need to be Buddhist to stay at a Thai monastery, and accommodation and food is usually free if you abide by their rules. Prefer to stay cheaply at hostels and guest houses? Unlike other parts of the world, in Thailand it’s sometimes cheaper to stay in double or triple rooms (with friends) than in communal dorm rooms. If you are by yourself and need accommodation, about the cheapest dorm beds go for 100 – 200 THB ($3.30 – $6.60) per night. Double and triple rooms cost 200 – 300 THB ($6.60 – $9.91) per night on the cheapest side. Always choose the open-air fan rooms instead of the air conditioned rooms to get the cheapest prices. (see Best Cheap Hotels In Bangkok for more info on cheap hotels in Bangkok, and search Agoda.com to see cheapest accommodation including dorms for your chosen travel dates. It’s worth noting Agoda gives you 7 per cent of each booking back in reward points which you can use for discounts on future bookings, so if you make a number of hotel bookings with them you can save more money). I believe the cheapest place to stay in Bangkok is The Overstay. Dorm beds are just 50 THB ($1.65) per night and many travelers choose to stay there and live for a while, as the name suggests. The benefit is that it is located outside of the city center, so food and other expenses are cheaper as well. If you are looking to travel very cheaply in Thailand, you will need to avoid booking transportation at any tourist oriented travel agency. Go directly to the transportation central office and buy your tickets form the source where no one will be making a commission from you. Trains are probably the cheapest way to travel long distances in Thailand if you are flexible, patient, and have time to spare. I recently took the overnight 3rd class train from Bangkok to Ubon Ratchathani on the border of Laos (a 12 hour journey) for only 205 THB ($6.77). 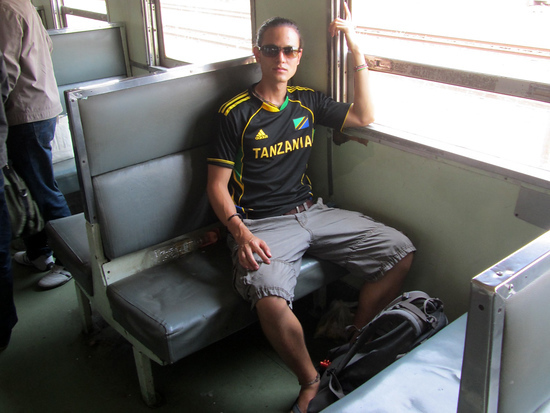 The price is 271 THB ($8.94) traveling from Bangkok to Chiang Mai on the 3rd class train. Local buses are the next cheapest way to travel in Thailand, and they go to every corner of the country. Some of the local buses for the long journeys are even air-conditioned, but don’t expect too much leg room, or much room to move at all. Cheapest buses can cost in the range of 250 – 350 THB ($8.25 – $11.57) for an overnight journey. Hitchhiking is possible throughout Thailand, just keep in mind that you might be in the back of a pick-up truck while cruising down a highway at frightening speeds. I’ve personally gotten a few rides for short distances, but not for long hauls. If you are on a tight budget but sill want to drink up and party, there are plenty of ways to do it on the cheap in Thailand. Forget about trendy bars and clubs in the center of town, to get the cheapest booze, look to the streets and in convenience stores. Luckily, most normal day to day bars don’t charge cover in Thailand. If you want to drink real brand name variations of whiskey, the cheapest 1 L bottles like 100 Pipers or Sangsom cost in the range of 200 – 400 THB ($6.60 – $13.21) at places like 7/11. Large bottles of beer (640 ml) are priced at 45 – 60 THB ($1.46 – $1.98) at convenience stores and usually cost 100 – 200 THB ($3.30 – $6.60) at real bars. Notorious booze “buckets” are synonymous with partying in Thailand. A small bucket is filled with a flask of Thai whiskey and mixed with soda and additionally some Red Bull. Going to bars and clubs, this is probably the cheapest way to get a buzz for your money. The normal backpacker route dictates the necessity of club partying in Bangkok, island hopping in the South, and riding on elephants and petting tigers in the North. 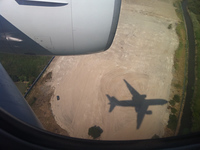 Follow this common route of activities and your “cheap” travel budget will plummet. Thailand receives an enormous amount of tourism and therefore the places that are famous and concentrated with tourists are not the cheapest places to go. If you plan to visit all the attractions written in the guide book, and follow the normal backpacker route, you can easily spend $20 – $40 a day. On the other hand, just being able to just see a new country, observe a different culture, and experience life in Thailand is what I consider the most valuable part of traveling – and it can be done on a very cheap budget. Sure you can spend 350 THB ($11.55) on entrance to the Grand Palace in Bangkok, but you can visit countless temples (like Wat Hua Lamphong) for free all over Bangkok. There’s nothing I enjoy more than just taking a walk through a local fresh market and absorbing all the sights and sounds. 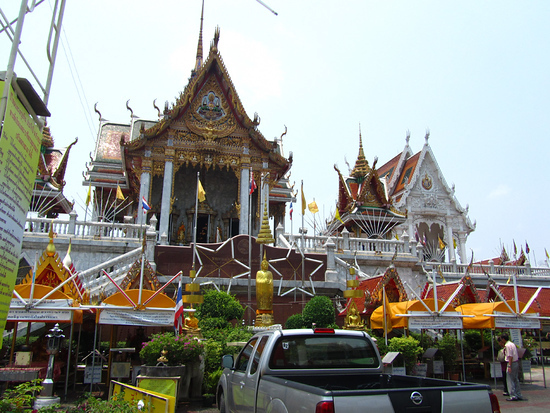 Bangkok is packed with exciting markets like Wang Lang, Khlong Toey, and Wang Wian Yai market. In general, traveling through Southern Thailand which is characterized by pristine beaches and island hopping is more pricey than traveling to any other part of the country. Isolated islands have the ability to monopolize the price of common necessities and charge whatever they please. That being said, if you have the budget to visit the South of Thailand it is absolutely beautiful. If you are looking to create a cheap travel strategy for Thailand, here are some ideas from around the country to get you started. The more time you have to travel, the less expensive (per day) your trip to Thailand will cost. The cheapest forms of transportation take initial time to organize, and because they are cheap, they take the longest amount of time. Be prepared that almost all budget transportation doesn’t abide by the exact schedule and there is a tendency to take longer than expected. Know this in advance, keep a positive attitude, and things will run much smoother. Having time to spare along with a rough travel plan, but not an exact itinerary, will help in keeping costs to a minimum. Keep in mind that these are the bare minimum prices without taking too many variables into play. As Thailand’s largest city and a giant melting pot of the entire country, Bangkok is a fascinating place to visit and usually the place where most visitors enter Thailand on international flights. 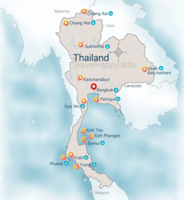 You can find the cheapest flights to Thailand using a flight comparison site like Skyscanner. To avoid high prices, try to couchsurf, don’t pay entrance for places like the Grand Palace (instead visit free temples all over town), eat neighborhood street food, fill empty water bottles at water filter machines, and take local buses instead of taxis. In my opinion, much of the island hopping is great, but isn’t a must when contemplating a budget. 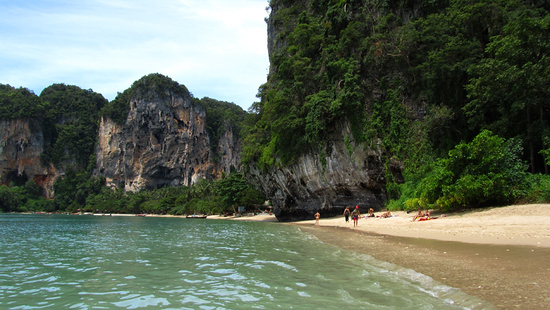 For an amazing beach destination head to the province of Krabi and then on to the beach town of Ao Nang. From there you can take a boat to Tonsai Bay (200 THB, $6.60), the quieter side of the famous Railay Bay. There are a number of places that offer very cheap bare-bones bungalows for around 150 – 200 THB ($4.95 – $6.60) per night for a double. The only option for food is to eat at the pricey restaurant guest house, so consider bringing some of you own food as well as your own bottle of alcohol. I normally travel with some oatmeal which is easy to cook, filling, and cheap! Sangkhlaburi in particular is one of my favorite destinations to visit in Thailand. 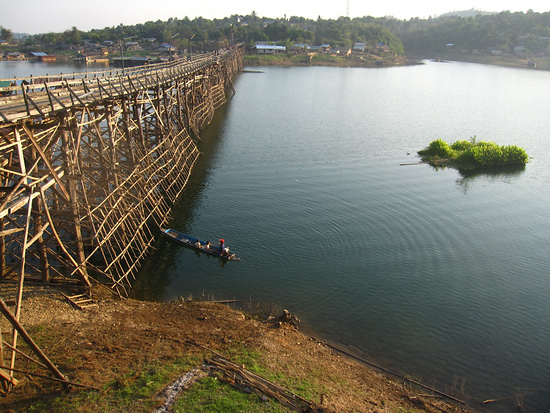 The tiny town is located on the edge of Burma, nestled in the hills and overlooking a beautiful lake. Sangkhlaburi is a superb place to relax, spend some time with friends, and avoid high costs. The morning market is stocked with all kinds of traditional cheap Thai and Burmese foods and an interesting array of local shoppers. Thailand’s big Northern city is well known for its elephant riding and “traditional” trekking home-stay tours that are priced according to what tourists will pay. However, trekking through the mountainous region of Thailand doesn’t need to be so expensive. Get in touch with community based organizations, like Chiang Mai hiking, a group of volunteers who organize weekly hikes out of their love of hiking! To catch an international flight, you’ll need to find your way back to Bangkok. Taking the 3rd class train for 271 THB ($8.94) is the cheapest option, if you have the time. As Thailand continues to progress and develop as a premiere tourist destination, popular places adapt and prices quickly inflate. Luckily, there is a local side of Thailand, the side where real people live their lives, the side that seems forgotten on the normal travel route, and that’s the side of Thailand that remains affordable. Doing some pre-trip planning, arranging accommodation beforehand, eating street food, and preparing a list of free activities (or just exploring), will ensure you enjoy the cheapest trip to Thailand!